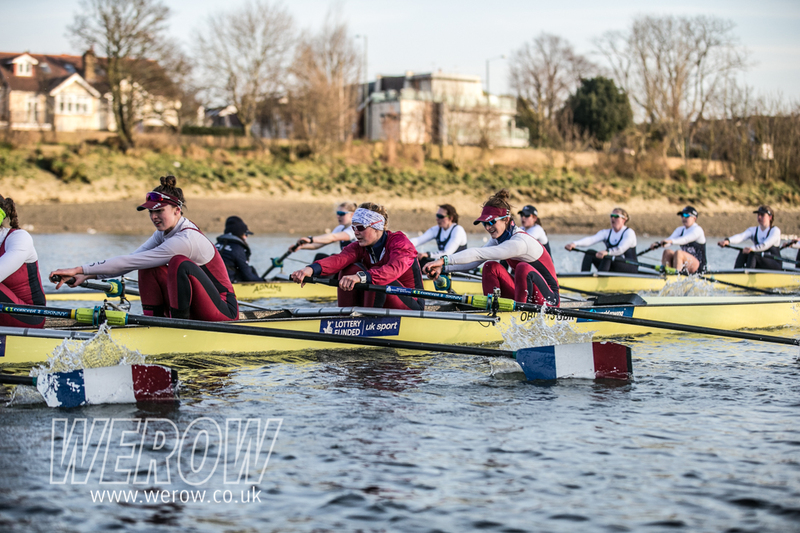 This Sunday saw the latest Boat Race warm-up match, this time between Oxford University and Oxford Brookes University. 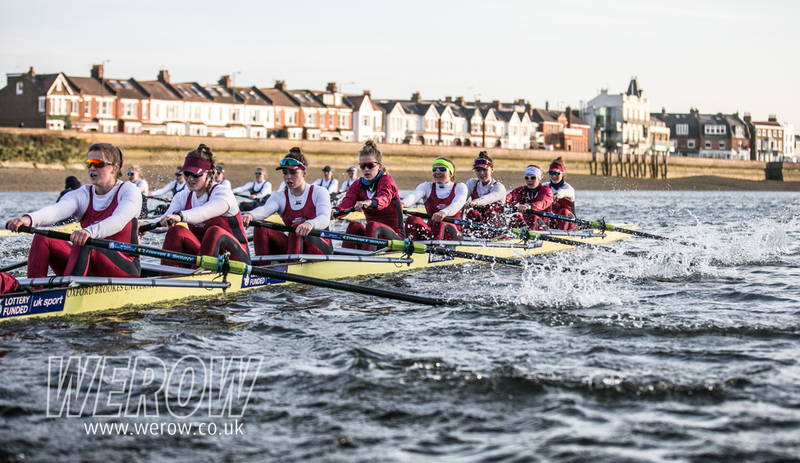 Always a favourite fixture in the calendar, this local derby is more about assessing Brookes’ form than seeing how the Boat Race crews are faring. 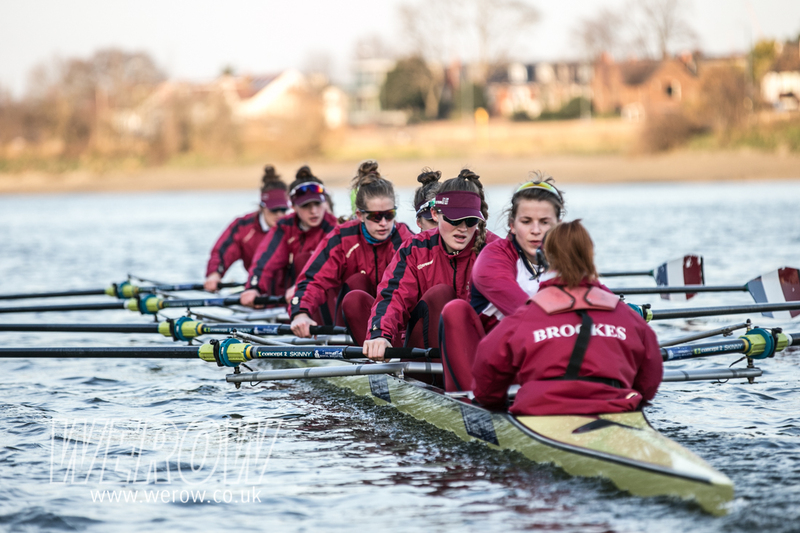 Brookes didn’t attend the BUCS Head so the next side by side comparison with other university and college crews will be at Saturday’s Reading University Head. 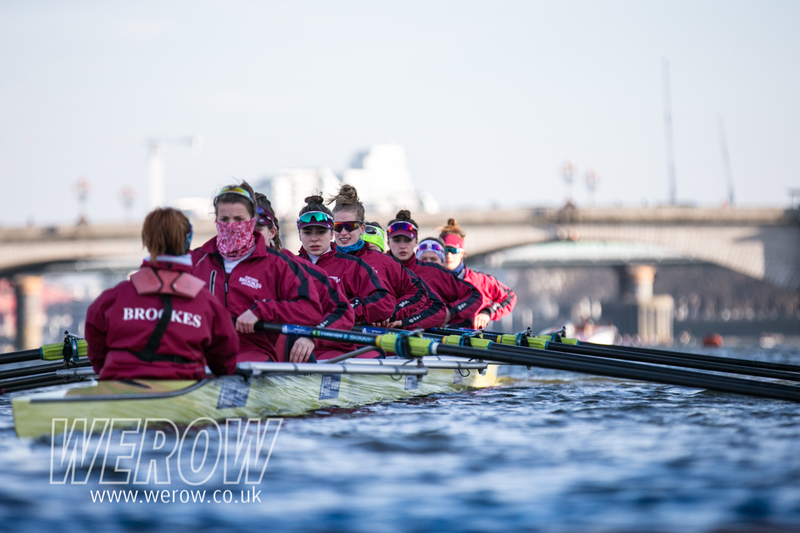 Brookes fielded four eights to take on the Oxford heavyweight men’s and women’s first and second crews. 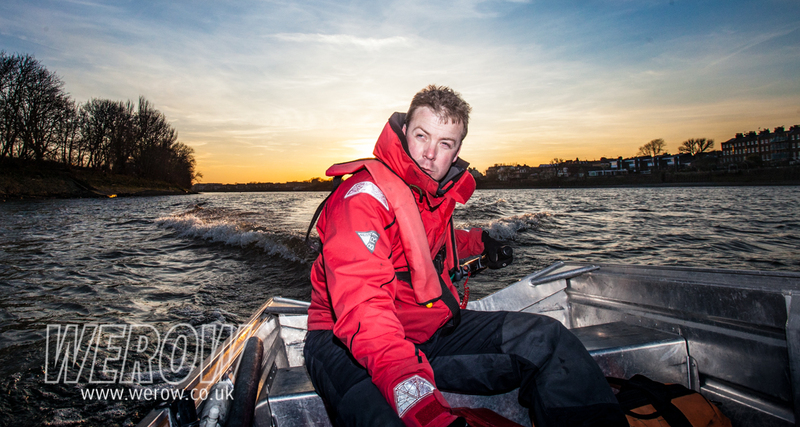 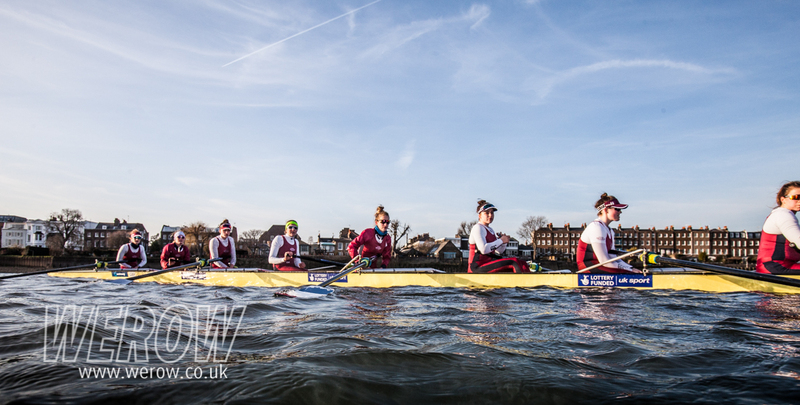 WEROW were given the opportunity to follow the women’s race which is not an official Boat Race media fixture. 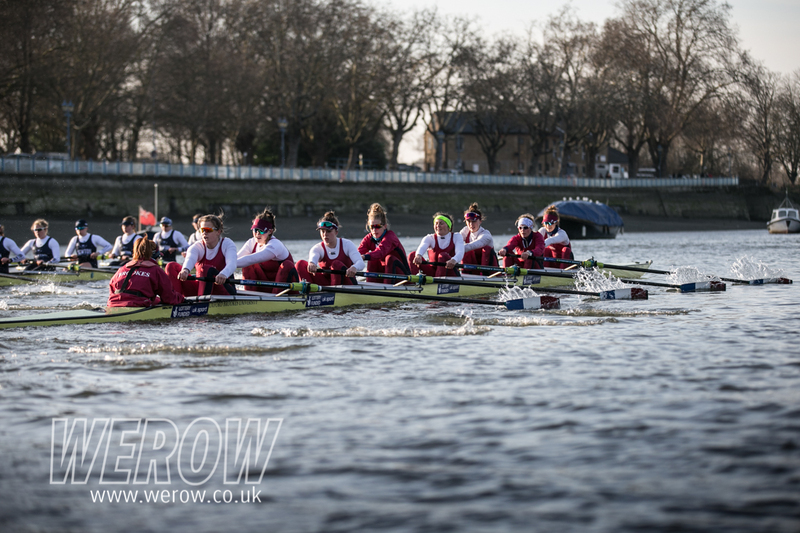 The women’s crews boated late in the afternoon on a bitterly cold Tideway, under clear blue skies from the Putney Embankment. 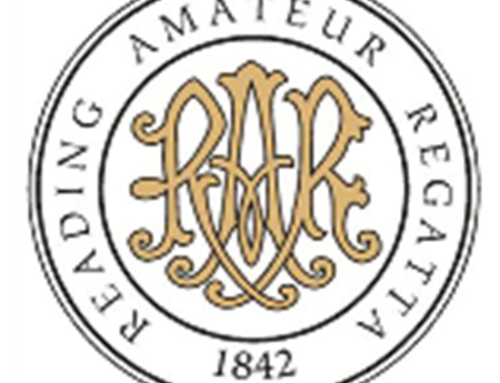 They were to row two pieces over the length of the Championship Course from standing starts. 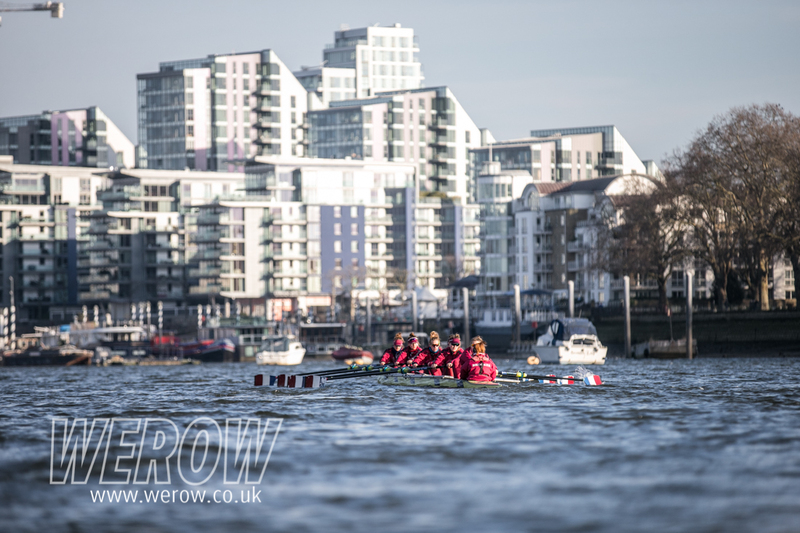 The first piece got off to a flying start from just below Putney Bridge with Oxford on the Surrey station (the Putney, south side of the river) and both crews were repeatedly warned for steering. 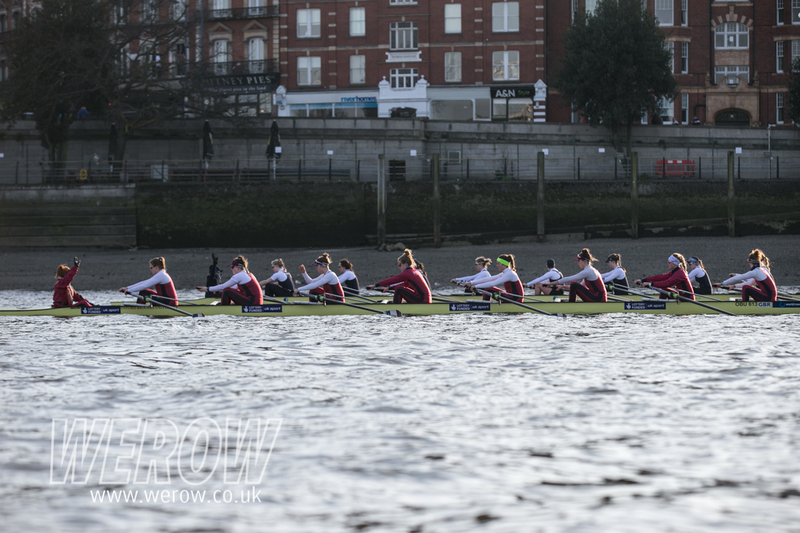 Brookes held onto Oxford for the first three-quarters of the piece with Oxford just leading by one-third of a length. 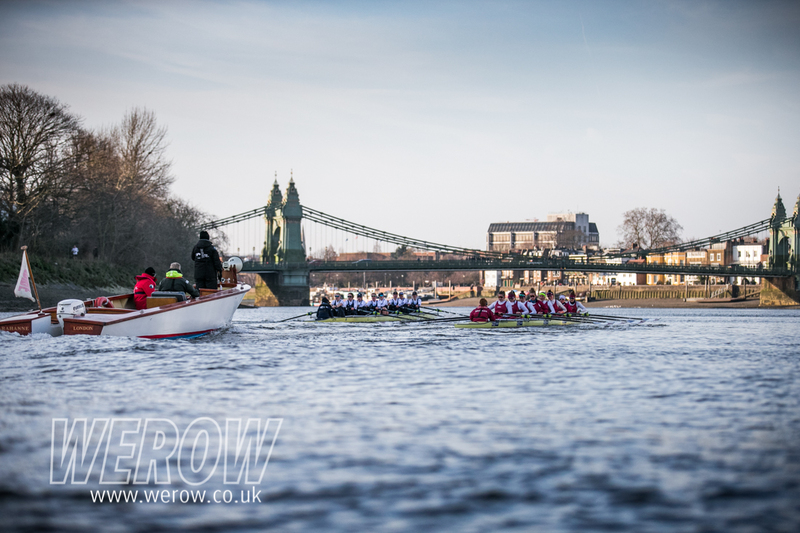 However leading up to Hammersmith Bridge, and with the disadvantage of the outside bend, Oxford pushed ahead to finish the piece three lengths ahead. 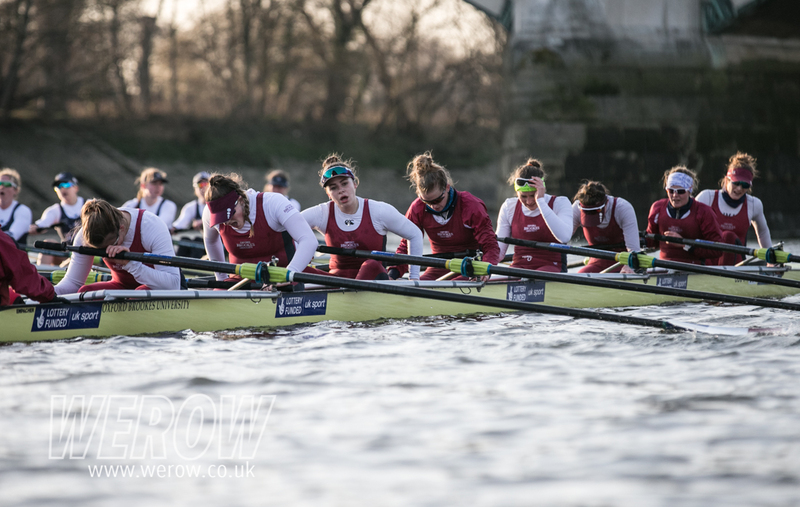 In the second piece from Chiswick Eyot to the finish at Mortlake, Brookes maintained contact with Oxford all the way to the line. 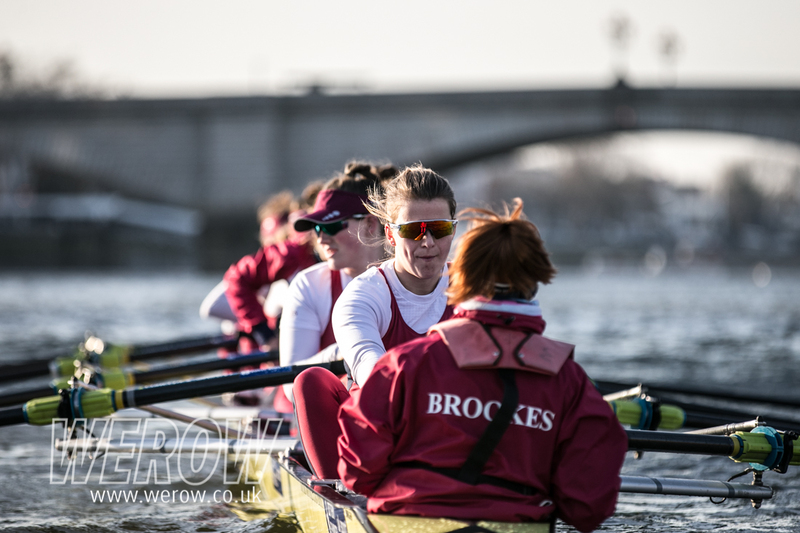 In a very tight match, it was clear that Brookes had stepped up their effort to hold Oxford all the way, taking advantage of the inside of the final bend. 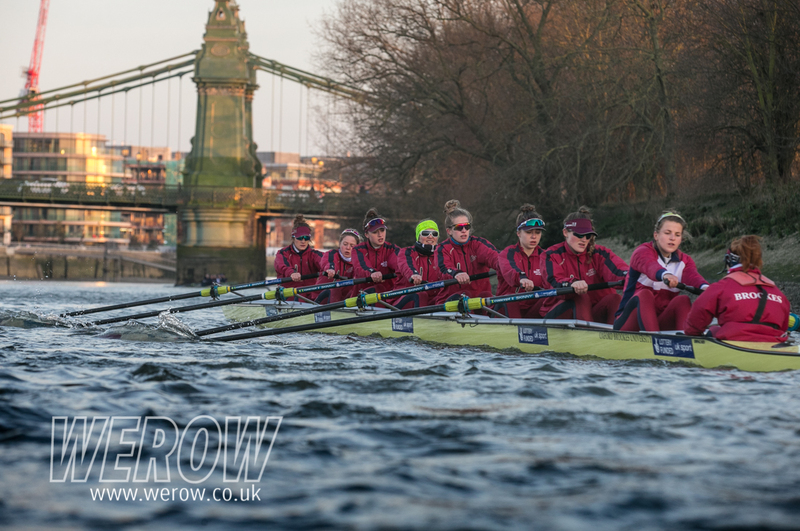 Oxford, looking much sharper than they did in their encounter with the University of London two weeks ago, eased ahead to finish with a lead of half a length. 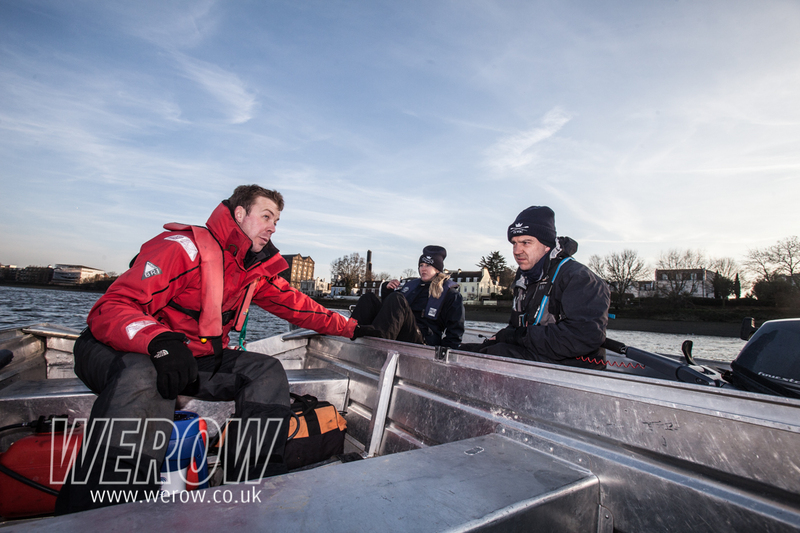 The Brookes crew look promising for the future season given that they will behind Oxford in the development of their fitness levels. 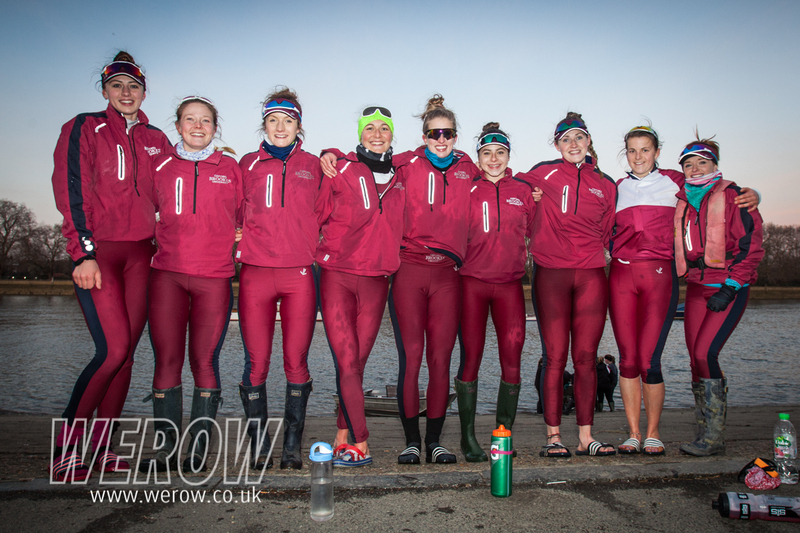 There is clearly huge potential in this crew with the likes of Imogen Mackie in the bow seat who represented GB in the U23 W4x in 2017 and came 10th at the recent lightweight Trials. 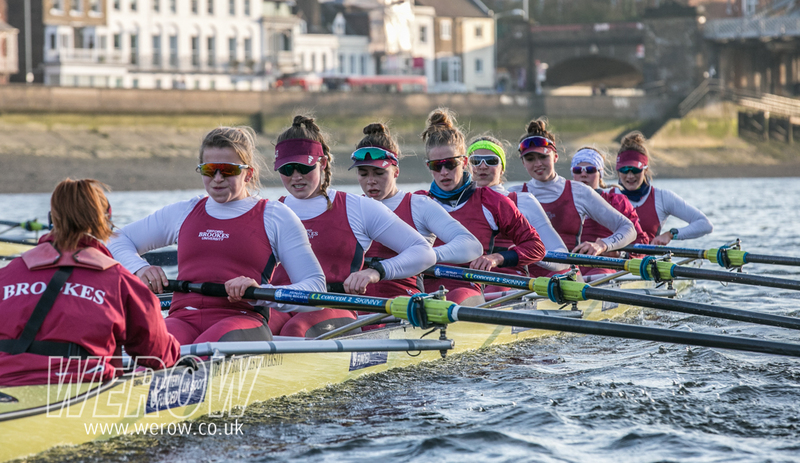 At four, Anna Boada Piero, who came 5th at the World Rowing Championships in Sarasota in the senior Spanish W2- with Anna Cid who was part of the winning Ohio State crew at Henley Women’s Regatta. 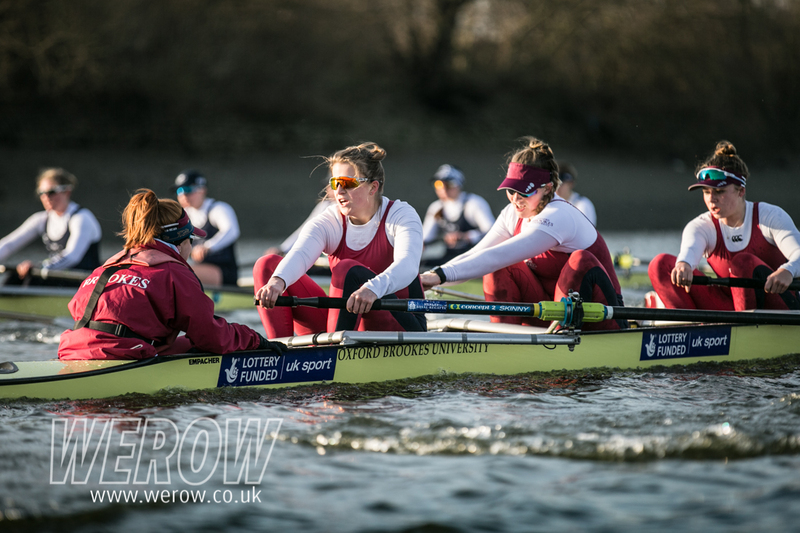 Ella Morgan was at six, a Junior international in 2017 and part of the Henley College Elite Rowing program run in conjunction with Henley Rowing Club. 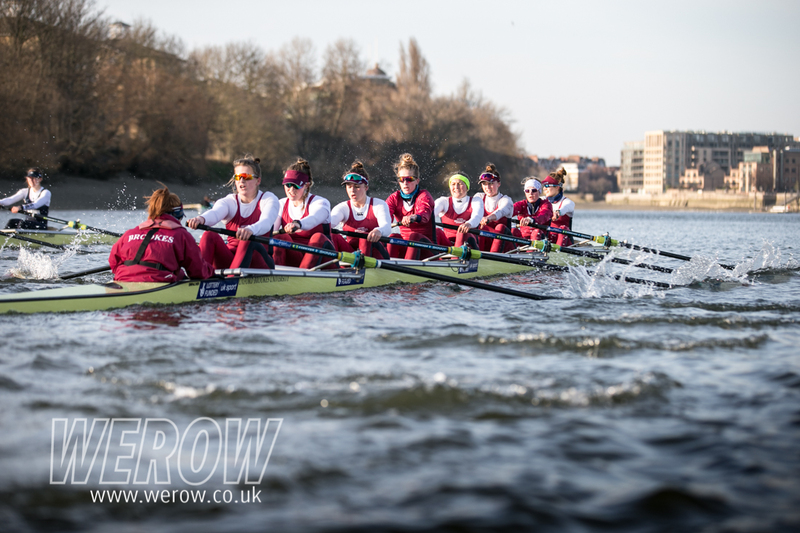 In contrast to Brookes, the Oxford women’s crew is relatively inexperienced. 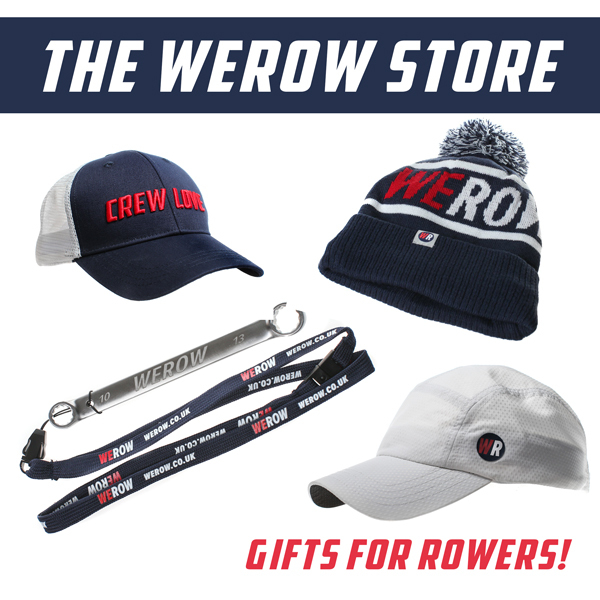 Morgan McGovern, rowing at five, represented the USA at the 2016 World Rowing Championships in the LW4x. 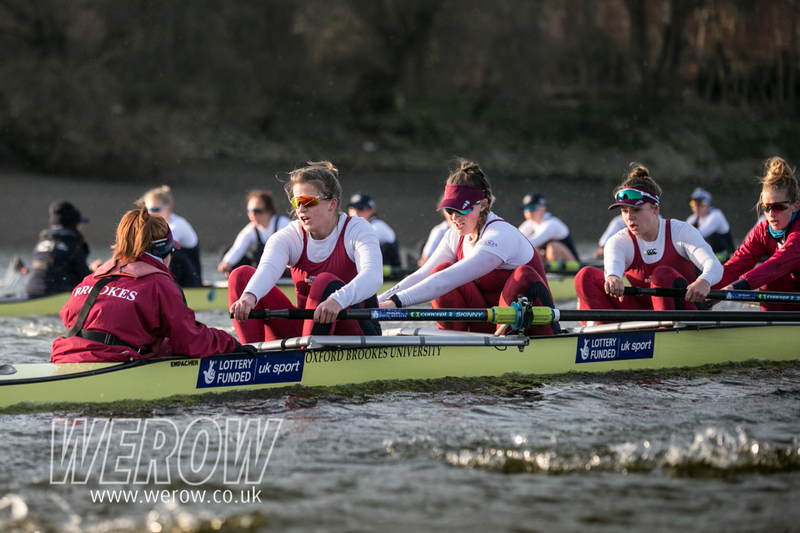 Cox Eleanor Shearer is back in the Blue boat for a second time along with Alice Roberts who started with Cheney School before moving to City of Oxford Rowing Club. 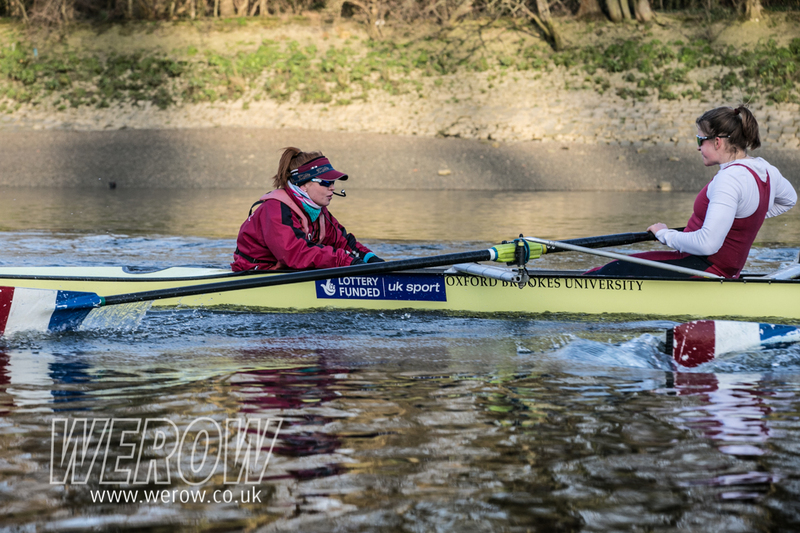 OUWBC president, Katherine Erickson, learned to row at Oxford having joined from Standford University and was in the losing Osiris (OUWBC second boat) in 2016. 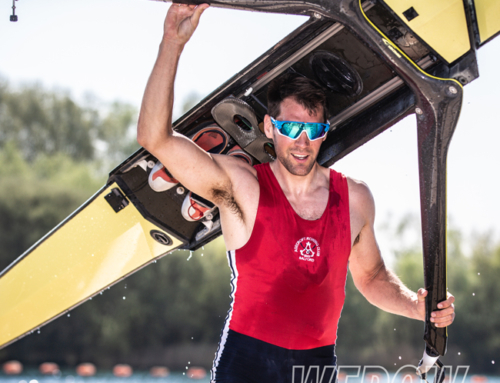 The men’s first boats had similarly close races but with Brookes taking the win in both pieces which will be hugely satisfying for the coaching team. 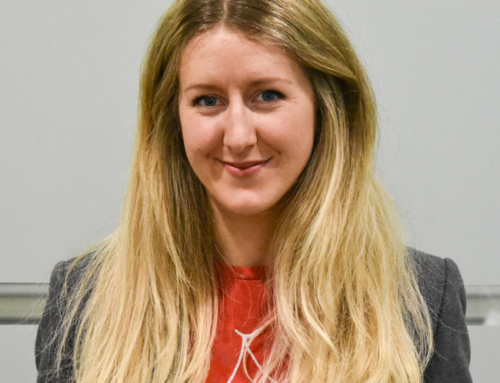 After such an outstanding season in 2017, the pressure to perform in 2018 will be as pressing as the collective unspoken desire to see these giants felled. 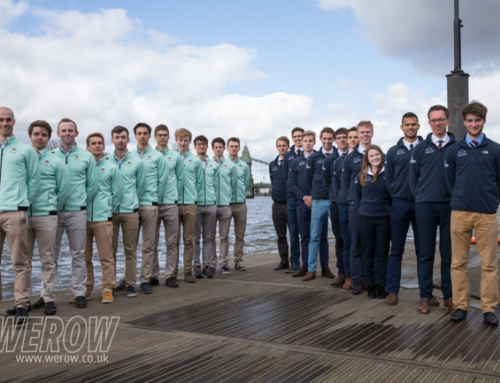 Matthew Hnatiw, who stroked the Temple winning crew in 2017, stroked this boat with Ladies Challenge Plate winners Morgan Bolding, Rory Gibbs, Matthew Aldridge, Harry Swarbrick adding experience and power ably harnessed by Harry Brightmore who coxed the M2+ of at Sarasota. 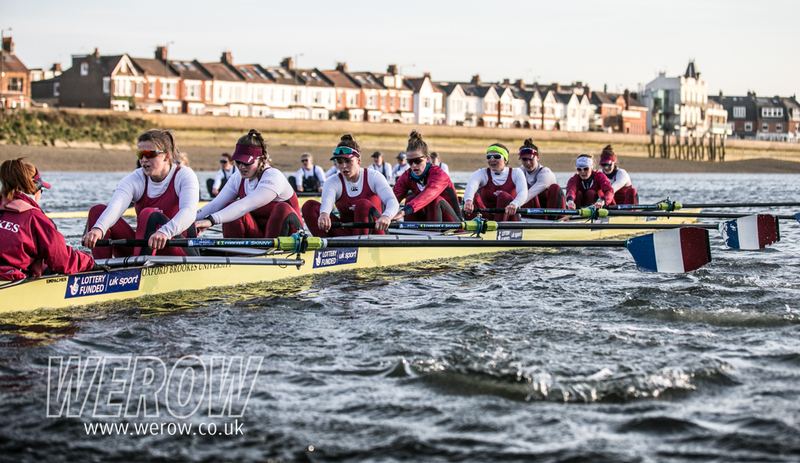 At six in the Blue boat was Josh Bugajski, who is studying oncology at Oxford University and was part of the Brookes Ladies Challenge Plate winning crew.